If MainStreet and CarClick don't meet all your needs, we can provide custom extensions to these frameworks that will meet your needs. 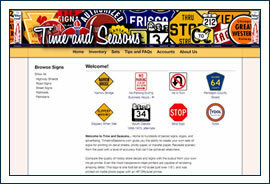 Time And Seasons is based off the MainStreet platform, with an additional MainStreet inventory module integrated into the website. Additional functionality required custom databases and features. All this was blended with MainStreet to create a seamless interface for customers.